A Look Back in Credit and Debt Collection Time - Ancient Sumer - Credit Mediators Inc.
Sumer is the earliest known civilization in the historical region of southern Mesopotamia, which is modern day southern Iraq. As the area was regularly flooded by the Tigris and Euphrates river system, leaving rich sediment behind when the waters receded, Sumerian farmers were able to grow an abundance of grain and other crops. This steady food source enabled them to settle in one place leading to a large area with several urban centers numbering into the tens of thousands. The Sumerians developed arithmetic, multiplication (and division), geometry, and algebra which became the mathematical tools to record and analyze their business transactions. 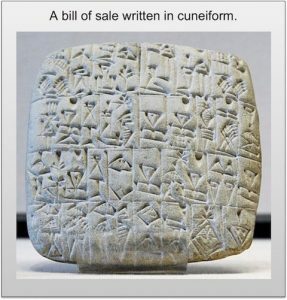 Gradually, large temples, which also doubled as centers of money, kept accounts on clay tablets of who owed what and when, designated in the currency of barley or silver. Commercial credit and agricultural consumer loans became very prevalent with trade credit being provided to finance trade expeditions. The interest rate on these loans was set at one shekel per mina per month. A mina is a unit of weight for silver and was divided into 50 shekels. Periodically, Sumerian rulers signed “clean slate” decrees that cancelled all the rural (but not commercial) loans and allowed bondservants to return to their homes. Customarily, rulers did this at the beginning of the first full year of their reign but they could also be proclaimed at times of military conflict or crop failure.